The World Cup 2019 is around the corner and every cricketer would be dreaming to represent his team in the prestigious tournament. However, there are many players who played for their country, performed well but could not make it to the world cup. The best example is India's very own VVS Laxman, who is often remembered for his majestic 281 in the Kolkata Test in which India came from behind to win. There are some players who are still playing for their respective international teams, but their hopes of making it to the World Cup squad are all but over. Here, we take a look at three such players who now don't have the slightest of the chance of making it to the World Cup but are enjoying a good period as a regular member of the team. 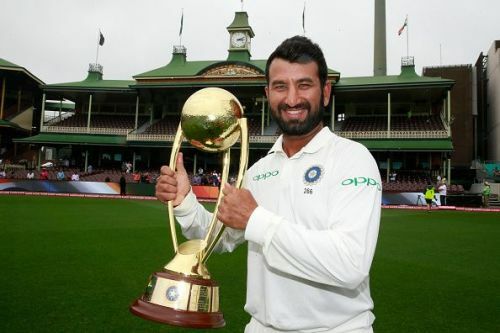 Pujara was the hero of India's victory down under. Cheteshwar Pujara is a name with which everyone is familiar now. The new wall of the Indian team, Pujara is an excellent Test player but at the same time, it'd be pretty difficult for him to make a comeback into the limited overs format for Team India. Pujara will remain a mainstay in the Indian Test team but his hopes of wearing the blue jersey at cricket's biggest even are almost non-existent.